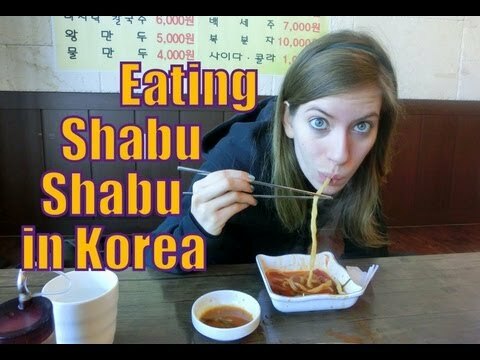 In this travel video we revisit one of of our favourite Shabu-shabu restaurants in Audrey’s area of Yongin, South Korea. I had just moved out of my Korean apartment in Jinsari – Anseong and I was already craving the home style cooking of my Korean mama from my favorite restaurant in my local area. Luckily, this fabulous Shabu Shabu restaurant was an adequate enough replacement. The last time we came to this particular Korean restaurant was in the summer; but now that it is winter the ‘hot pot’ aspect of the meal is far more appealing given how cold it has been outside of late. It’s the perfect winter food as tender slices of beef, leafy greens, noodles, mushrooms, potatoes and other ingredients are all cooked in a simmering hot pot filled with a spicy broth. There was so much food we struggled to finish it all; however, I gave my best effort to dust it off. Shabu shabu is one of our favourite communal style do it yourself Korean meals and we highly recommend it to anyone. With Japanese origins, it has really caught on in Korea and China. The first time I ever tried this kind of hot pot was when I was a University student in Edmonton, Alberta, Canada. With the different spices and sauces it’s similar in many ways to a western fondue – except it is far more spicier! In my opinion, it’s quite a bit better. At the end of the meal fried rice is made out of the leftovers along with complimentary coffee and mints to help mask the taste of the spicy meal. Here is another video we made eating Shabu Shabu earlier on in the year in August. The day I arrived in Korea, my director and recruiter took me out to a place where we cooked pork on a grill (looked like thick pieces of bacon almost). I don’t know what it’s called but man it was good! But on my first “work” day, my director took me out to lunch at a place like this and we had shabu-shabu. It was really delicious. Thank you, these videos have been so helpful with getting adjusted here in Suwon. Hey Tim, sounds like you’re having a great time in Korea these days. That thick bacon on the grill is called Samgyeopsal. I’m really glad you’re enjoying the food so far. Suwon is an ideal place to be based.